For his role in importing nearly 124 000 counterfeit CBi earth leakage devices and circuit breakers from the Peoples’ Republic of China, Abdool Kadar Omar Khan (55) – sole proprietor of the businesses trading under Akronix and South Star Technologies in Lenasia – was convicted in the Specialised Commercial Crimes Court, Johannesburg, on June 2 for contravening the Counterfeit Goods Act 37 of 1997 and the National Regulator for Compulsory Specifications (NRCS) Act 5 of 2008. A raid at Khan’s premises in November 2011 uncovered 17 683 counterfeit CBi earth leakage devices and circuit breakers. It was discovered that, of the imported consignments of these safety critical protection devices, 106 295 counterfeit devices had already been sold. Consequently, according to court papers, it is estimated that the people who live and work in at least 25 000 businesses and homes are potentially exposed to “significant risk”, including fire, electrocution and death. Khan was convicted on two counts under the Counterfeit Goods Act and two counts under the NRCS Act. Between 21 September 2009 and 21 November 2011, Khan imported 123 978 counterfeit CBi circuit breakers and earth leakage devices from the Peoples’ Republic of China “while knowing that those safety critical devices did not emanate from CBi and, without taking any steps to verify the authenticity of those devices”. Khan sold and distributed 106 295 of these counterfeit CBi devices to a number of customers, generating R5 353 012 from the sales, according to court documents. The remaining 17 683 devices were “detained” on 21 November 2011 according to the provisions of the Customs and Excise Act 91 of 1964. These items were examined by CBi and all 17 683 devices were found to be counterfeit in terms of the Counterfeit Goods Act. All the imported circuit breakers and earth leakage devices constitute “counterfeit goods” in terms of the Counterfeit Goods Act – the 106 295 that were sold as well as the 17 683 that were seized. Under Counts 3 and 4, Khan admitted that he contravened the provisions of the NRCS Act as the imported devices did not comply with and were not manufactured in accordance with the Compulsory Specification for Earth Leakage protection units VC 8035 or the Compulsory Specification for Circuit Breakers VC 8036. Khan did not take any steps to confirm that the devices complied with the respective compulsory specifications and failed to keep or supply the national regulator with the records as prescribed by the Minister and without paying such fees to the national regulator as prescribed. On Count 1, Khan was sentenced to a fine of R1 402 191.18 (R11,31 per unit) or one hour imprisonment per unit (123 978 units) wholly suspended for a period of five years on condition that Khan does not contravene the provisions of the Counterfeit Goods Act, 37 of 1997 during the period of suspension. On Count 2, Khan is sentenced to a fine of R199 994.73 (R11.31 per unit) or one hour imprisonment per unit (17 683 units), half of which is suspended for a period of five years on condition that the Khan does not contravene the provisions of the Counterfeit Goods Act, 37 of 1997 during the period of suspension. Counts 3 and 4 were taken together for the purposes of sentencing and Khan received a sentence of one year in prison, which was suspended for three years on condition that, during that time, Khan does not contravene the provisions of the National Regulator for Compulsory Specifications Act 5 of 2008. According to the court papers, “circuit breakers and earth leakage devices are safety critical devices intended to protect the electrical installation as well as humans and animals against fire and electrocution hazards”. ”For this reason it is of paramount importance that circuit breakers and earth leakage devices installed in homes and businesses comply with the Compulsory Specification for Circuit Breakers VC 8036 and the Compulsory Specification for Earth Leakage Devices VC 8035. The installation of non-compliant circuit breakers and earth leakage devices could have devastating consequences, posing a significant risk to human and animal life as well as to property. The court papers state: “Compliant earth leakage devices detect small stray currents that may leak into equipment or living beings, which could result in damage to equipment, shock and death. During testing, the counterfeit and non-compliant earth leakage devices of the accused failed to comply with the requirements of the Compulsory Specification for Earth Leakage Protection Units VC 8035 resulting in those devices failing to interrupt the circuit when a dangerous leakage current was detected. The consequences of such non-compliant devices are significant and include electric shock with ventricular fibrillation being the main cause of death. There is also evidence of death as a result of asphyxia or cardiac arrest. “During testing, the non-compliant circuit breakers of the accused failed to comply with the Compulsory Specification for Circuit Breakers VC 8036. This can result in failure of the electrical installation or attached equipment, resulting in those devices becoming a life-threatening danger, through becoming a fire hazard due to inter alia the continued temperature rise within the circuit breaker itself or the conductors in the electrical installation or the appliance connected to the circuit. 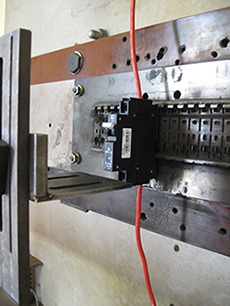 During the testing of the non-compliant circuit breakers of the accused, a variety of failures occurred including contact tips welding, excessive temperature rise and material characteristic not being compliant. This can result in a fire hazard, in the electrical installation as well as in equipment, resulting in destruction of property and the loss of life. “CBi is of the opinion that Abdool Khan was the major importer of these counterfeit devices. In the interests of the general public, CBi has re-certified all the distributors of its products to ensure only genuine CBi products are sold,” says Coen Esterhuizen, managing director at CBi-electric, adding that a complete list of authorised distributors is published on CBi’s website. A civil matter is pending in the High Court of SA Gauteng Division, Pretoria for damages suffered by CBi as a result of Khan’s conduct. • Electrical Power Accessories in Jeppe (8 940 circuit breakers and 1 521 earth leakage devices). • Famshir Electrical, Ormonde (32 225 circuit breakers and 3 302 earth leakage devices). • Globe Electrical, Denver (547 circuit breakers and five earth leakage devices). • Greatech, Malboro Gardens, (19 824 circuit breakers and 2 195 earth leakage devices). • Kensington Electrical (29 020 circuit breakers and 952 earth leakage devices). • Manstel Projects, Germiston (400 circuit breakers and 102 earth leakage devices). • Soweto City Electrical (2 319 circuit breakers and 93 earth leakage devices). • Tuscaloosa (1 680 circuit breakers). • Venus Electrical (964 circuit breakers and 50 earth leakage devices). • Voltsing, Hillfox (1 452 circuit breakers). • Nasco Plumbing, Booysens (9 618 circuit breakers and 220 earth leakage devices). • Electrical Protection AC (1 344 circuit breakers). • Bobs Hardware, De Deur (656 circuit breakers and 60 earth leakage devices). • Gauteng Electrical (984 circuit breakers and 40 earth leakage devices).